In 2013, a survey on global burden was conducted through the Institute for Health Metrics and Evaluation in Seattle. This study was measured by calculating how many people in each country suffer from a particular condition and multiplying that number by each ailment's seriousness on a scale of zero to one, zero being innocuous and one being deadly. 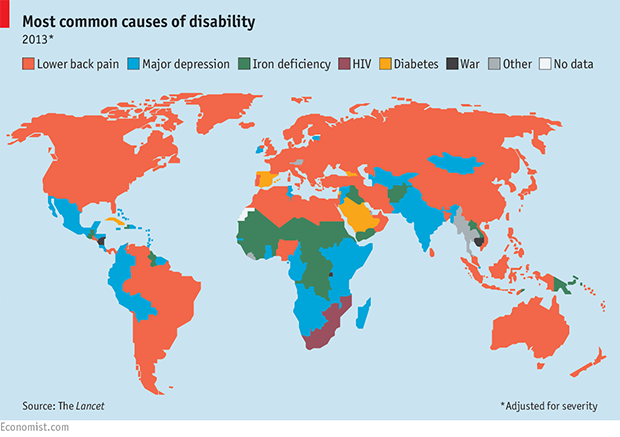 As the map shows, wealthier pockets tend to suffer more from lower back pain and diabetes, whereas war-torn areas have high rates of anemia, and younger, lower-income nations have disproportionate amounts of clinical depression.